On the Intraday Chart the internal wave structure still looks constructive for the bulls, so we are still expecting higher prices ahead, and we are likely working on the tail end of a wave !iv! of $iii$ correction. Within wave .iii. 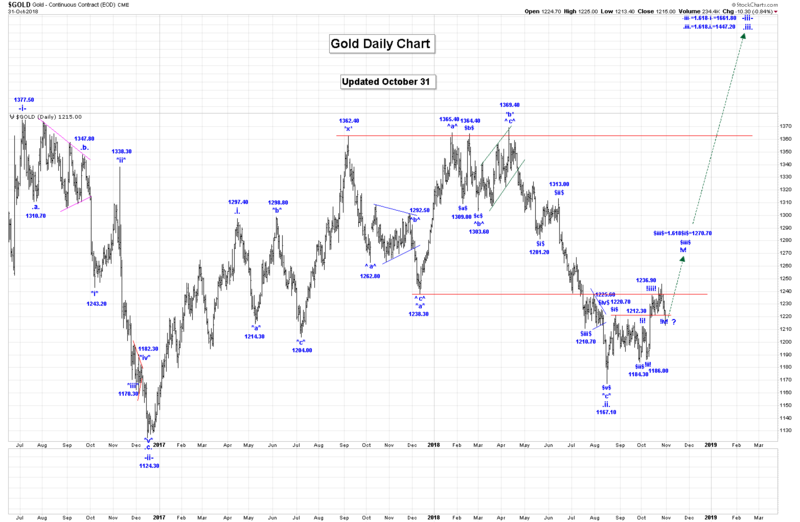 we are now working on our first impulsive sequence, as shown on our daily gold chart. Within that first impulsive sequence we believe that we are working on a subdividing wave $iii$. Within wave $iii$ we have adjusted the location of the end of wave !iii! to be 1236.90, as shown on the chart. If that is the case then we are now falling in wave !iv! of $iii$. We suggested wave !iv! of $iii$ will likely test the 1220.00 level, which we are doing now. Upon completion of wave !iv! of $iii$ we expect one more rally in wave !v! of $iii$ to complete all of wave $iii$. Our initial projected target for wave $iii$ is 1270.70. .iii. = 1.618.i. = 1447.20. Wave .iii. should subdivide into a 5 wave impulsive sequence in its journey higher. We do have higher projections, but $1270 and $1447 is our big focus for now. Trading Recommendation: Long gold. Use puts as stops. We continue to work on the assumption that all of wave ii is complete at the 13.96 low and that have we started to rally in the initial phases of wave iii. 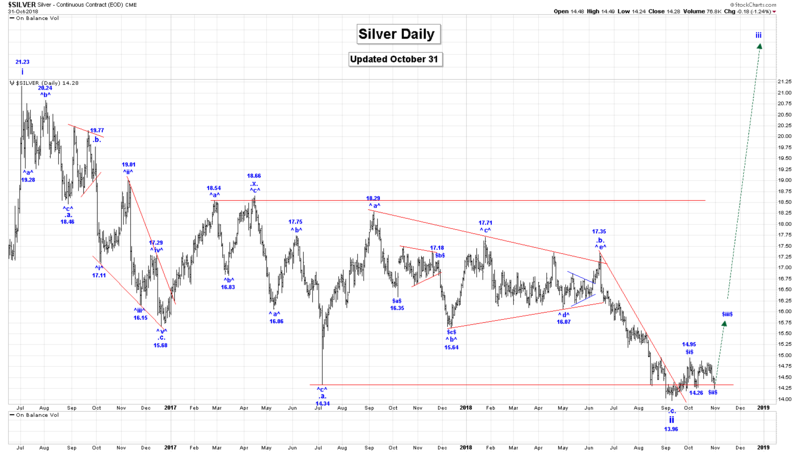 On the daily silver chart we have shown our initial wave count for the start of wave iii higher. Within wave iii it now looks like wave $ii$ is still underway, so we should expect one more drop to reach at least the 14.26 level to complete a three wave correction as shown on the chart. Once wave $ii$ ends we expect a sharp rally in wave $iii$. We will provide our initial projections for the end of wave $iii$ and iii in the next couple of days, once we believe that all of wave $ii$ is complete. Trading Recommendation: Long silver. Use a put as a stop. 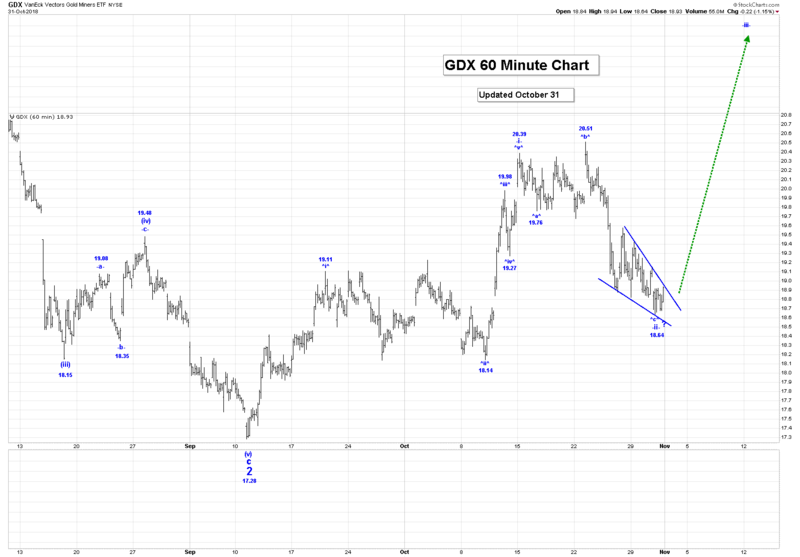 It looks like all of wave -i- ended at the 20.39 and all or most of wave -ii- at the 18.82 low, although we do have an incomplete small ending diagonal triangle formation shown on the 60 Min GDX Chart. This suggests one more drop below the 18.82 low is required to complete this formation and likely all of wave -ii-. We have now reached at least our 50% retracement level are waiting for confirmation that all of wave -ii- is complete at the 18.82 low. Once wave -ii- ends we expect a sharp rally in wave -iii-. We will provide our projections for the end of wave -iii- when we are sure that all of wave -ii- is complete. 3 = 1.618(1) = 48.95. Kinross: It has now completed its minimum requirements for a completed wave (ii), at the 2.58 low. A wave (iii) rally is now underway. Barrick: We have completed the minimum requirements for a completed wave (ii) at the 9.53 low. A wave (iii) rally is now underway. HUI: We have completed the minimum requirements for a completed wave (ii), at the 131.12 low. A wave (iii) rally is now underway. XAU: We have completed the minimum requirements for a completed wave 2 at the 60.59 low. A wave 3 rally is now underway. 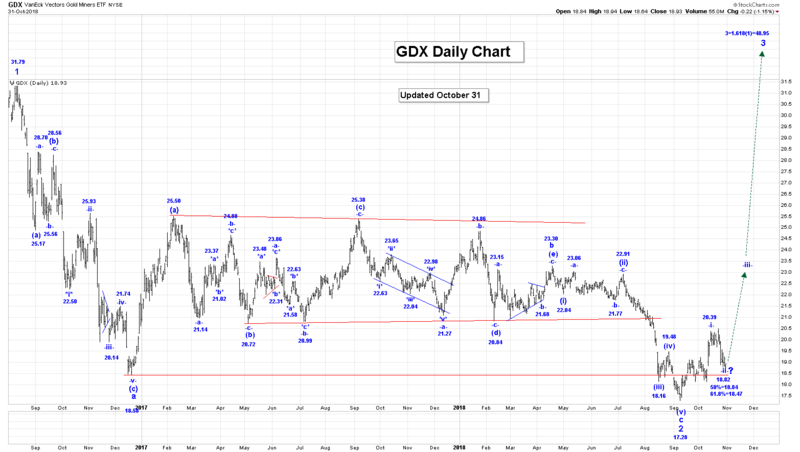 Trading Recommendation: We continue to suggest buying all of the above gold stocks and indices, for a long term hold. Active Positions: We are long the GDX, ABX, KGC, NEM, SSR, and TSX:XGD with no stops!! Free Offer For 321Gold Readers: Please send me an Email to admin@captainewave.com and I’ll send you our free “US Stock Market Bear Rally” report. Here we highlight the most positive and negative wave counts for the US stock market, with key tactics to play both the rallies and the big waves down!